There are many causes of and classifications for headaches, but by far the most common type is the tension headache, which accounts for nearly 90% of all cases. The pain is often described as a constant pressure on both sides of the head at once and is typically mild to moderate but may be severe. While tension headaches are unpleasant, they’re also temporary, typically lasting as little as 30 minutes or as long as several hours. Most of us have learned to cope with them with over-the-counter analgesics such as ibuprofen, acetaminophen or aspirin—plus perhaps a bit of rest, a massage or an ice pack for the tough cases. Migraine headache is less common, but it is a chronic condition affecting roughly 15% of the population at some point and often runs in families. Migraines typically present with moderate to severe pulsating pain on one side of the head, sometimes accompanied by nausea and increased sensitivity to light and sound. They also tend to last longer than tension headaches, from two to 72 hours or more. Once diagnosed, most sufferers learn to manage the condition through varying combinations of trigger avoidance, pharmacological prevention and medical symptom treatment. Medications are generally more effective if used earlier in an attack. If you experience a headache with one or more of these warning signs, play it safe and seek medical attention. About four to five percent of the population suffer from “chronic daily headache,” classified as experiencing fifteen or more days per month with a headache. 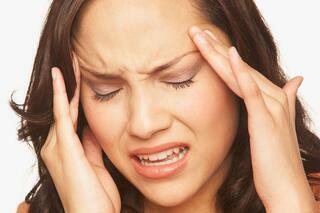 They may be tension-type or migraine headaches. Either way, headaches of such frequency can make life quite difficult. Specialists cannot cure chronic headache, but they can work with sufferers to explore the vast array of medicinal and non-medicinal methods, which include physical therapy, acupuncture, relaxation training, biofeedback, heating/cooling, behavioral therapy and dietary changes.